Nestled in the gated community of Snowline in Glacier, our well built 3 bedroom, 2 bath home is the ideal place for your mountain getaway. Whether you enjoy biking, hiking, snow sports, river rafting or just want a relaxing place to play games, watch movies and soak in a hot tub, the house will not disappoint. Plug your cell phone/mp3 player into the stereo system and relax in the open floor plan living area with gas fireplace. Entertain the kids with a movie in the cozy open loft above the living room while you enjoy a classic flick, Netflix, Amazon streaming or Sling TV on our 55" smart TV. Or feel free to spend the afternoon on the large deck. You will find plenty to do in the surrounding wilderness, the house itself or using the great facilities in Snowline. 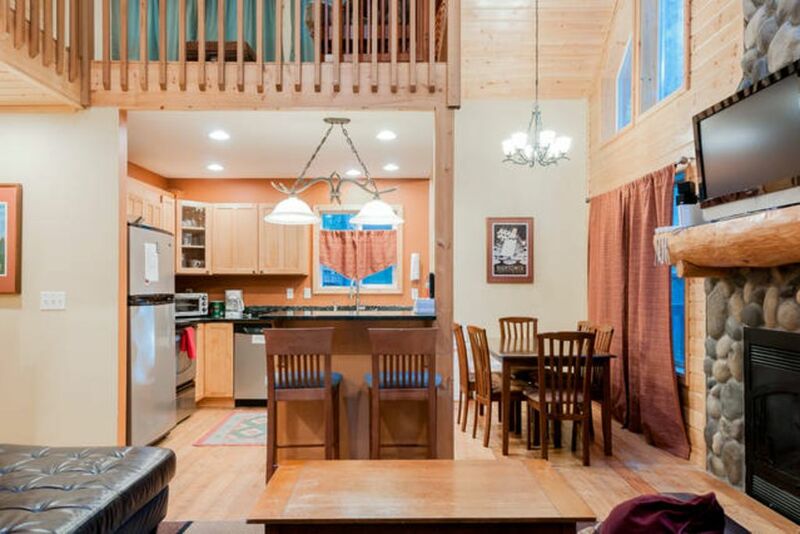 The clubhouse and recreational area are just a short stroll from the cabin. There you have access to an outdoor swimming pool, tennis courts, basketball court, pickle-ball court, children's play area and children's fishing pond (12 years old and under). The bedrooms on the main floor are both similar size with comfy queen beds. They share the beautiful main floor bathroom with slate tiling throughout. Upstairs is an open and spacious master bedroom suite with a memory foam pad on top of a King size bed and private attached bathroom. The large utility closet contains a pack and play for your young one, so leave yours at home! There is a cozy movie viewing area and futon at the top of the stairs perfect for young children, feel free to make use of our large VHS & board game collections, and Nintendo Wii. The living room contains a 55'" smart TV mounted above the gas fireplace for streaming shows, movies and some live Television via Netflix/Amazon Prime/Sling TV, an adjacent dining space and the open floor plan connects to the kitchen as well. We allow up to 1 extra person for 7 total, for an extra person per night fee. There is a futon in the loft and there are linens provided for this bed. Covered BBQ with propane is provided for your year round grilling needs. Our family are avid travelers and appreciate an adventure. We use VRBO for our own vacations and appreciate the little touches that help make your stay enjoyable. Comfy beds, a well stocked kitchen. instruction book for the home and some useful info about the area go a long way. We love the area. Glacier and Mt Baker are throwbacks to an era before mega resort developments and chain restaurants / shops. Enjoy a truly tranquil and relaxing vacation. The open kitchen allows meals to be prepared while watching a movie or enjoying a conversation with family & friends. Every season offers its own list of fun outdoor activities. Even a rainy fall day is an excuse to adventure under the canopy of the giant forests just a short drive from the cabin. Winter and Spring allow for great access to snow sports. Summer is a time to enjoy the hiking trails, long days and access to the swimming pool, trout pond & tennis court. Free nationwide long distance is provided. Be advised that no cell phone company currently has service in glacier. Gas fireplace Is the main source of heat for the home, bathrooms both have electric heaters as do the downstairs bedrooms. Clean, fresh sheets provided. We replace them at least every year or if they are no longer comfortable and clean. Do not park on the road, there is plenty of room in our driveway for 3 or 4 cars. DSL is available via Ethernet cable in the kitchen/living area or via wifi throughout the house. Comfortable sectional sofa in the open living room seats 4 very comfortably or 5 cozily. Filters are provided, and there is a grinder in the home so feel free to bring your favorite beans. Toaster Oven on counter top. We aim to stock the kitchen with all the utensils, plates, bowls, glassware (wine glasses, beer steins, coffee mugs etc) you could need on your vacation. There are two bar stools for overflow seating at the kitchen bar. Sling TV has 30+ live TV channels, including ESPN and an extensive library of free streaming content. Bring your own library, stereo is MP3/phone ready! A small collection of kids toys and a few children's books are in the home. 120 VHS tapes and a some DVD movies. Featuring comedy's, drama, kids, action, love, award winning and documentary. Patio furniture with table and seating for 6. 200 yard from the home is a community tennis court. It is first come, first serve. Unfortunately the 3 steps in the front of the house do not have a ramp. If you can get help and and down the steps, the ground floor bedrooms and bathroom (with shower) should be very manageable. 250 yards from the home at the clubhouse. Only open between Memorial and Labor day. Seats 4 comfortably, 5 cozily. Built in Boise Speakers, bocce ball, ladder ball and access to the community amenities. The house is cozy and clean. The hot tub was a big hit with our children...and adults. We took the kids sledding at Mt. Baker which is a short drive and the kids had a great time. During the summer the gated community has an outdoor pool which my kids are already asking to go back so we can enjoy the pool in warmer weather. My only suggestions would be a privacy screen from the hot tub to the neighbors right next door. We had a great time and will definitely be back. Thanks James for sharing your cabin with us. We loved our stay here. The perfect ski getaway for our family. We loved the location of the cabin. The cabin has everything we needed. The cabin was well equipped in the kitchen. The location was quiet and we enjoyed the recommendations of restaurants and shops nearby. We would love to return. Great home base for a weekend on the mountain! Fantastic location, close to Mt Baker Ski area. Very nice cabin with a few essentials close by. Cabin is very nice, comfortable with all the essentials for a great Ski weekend! The three bedrooms make it a great fit for a family or a few couples. We will be back! Comfortable, clean and in a great neighborhood. Also walking distance to a restaurant. Can’t wait to return!!!! Pickleball, tetherball, trout fishing in Snowline for children 12 and under.